Q: What is the source of fish for the oil? A: Our Primal Omegas fish oil comes 100% Norwegian Arctic Cod Source, Wild Caught. They are 100% Sustainable - sourced from food trimmings (no additional fish were caught). Omegas are 100% Pure triglyceride form, not the ethyl esters. They are also 100% Traceable, you can QR code the back of the bottle to show where the exact pills in that bottle came from. No fish odor, fish burps, or reflux! Q: What is the source of gelatin in your omegas? A: The gelatin is from beef gelatin. Q: What is the shelf life of Primal Omegas, and how should they be stored? A: Each capsule includes the antioxidant vitamin E to help maintain freshness and potency for up to two years. It maintains optimum potency for up to 18 months. Refrigerating or freezing can prolong shelf life, but it is not required. Q: Are the Primal Omegas Pharmaceutical Grade? Q: How much omega-3 do I need every day? A: Supplementing with high-quality fish oil to fulfill your omega-3 needs is more important than ever. 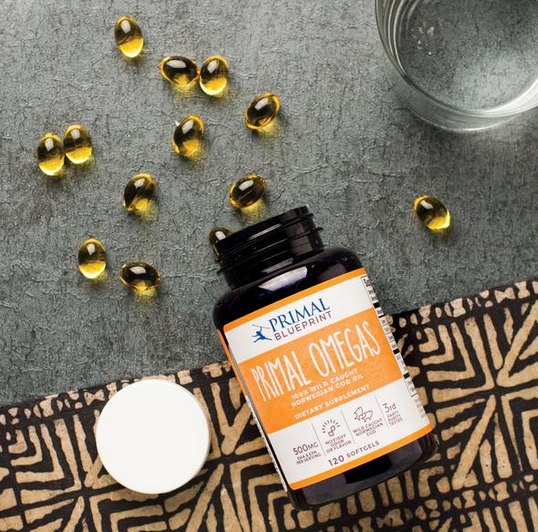 Primal Omegas make sure your omega-3:omega-6 balance is optimized by delivering both EPA and DHA (the preferred omega-3 sources) in every capsule. Various sources suggest you get 500 mg of omega-3s in the combined forms of EPA and DHA per day. According to the American Heart Association (AHA), individuals with heart disease should consume 1,000 mg of EPA and DHA each day. For individuals who need to lower triglyceride levels, the AHA recommends 2,000 to 4,000 mg of EPA and DHA per day. If you have a heart condition or a triglyceride condition you should consult your physician for recommended dosages. Our Primal Omegas are highly purified and very low in purines (if any), making them a better omega-3 choice than fresh fish! Q: Are the Primal Omegas egg and dairy free? Q: Can I get the same benefits from flax oil? A: You can’t. Some animals can convert the ALA form of omega-3 from flax into DHA/EPA, but humans just don’t have the machinery for it, and most of the omega-3 gets wasted. Young women have a better conversion rate, but you’d be better off just taking fish oil. Q: What’s the difference between omega-6 and omega-3? A: Both omega-3 and omega-6 are essential fatty acids that your body needs to sustain health, however, omega-6 is pro-inflammatory when consumed in excess, and omega-3 is an anti-inflammatory powerhouse. The modern diet of processed foods and pro-inflammatory industrial seed oils like canola oil deliver whopping amounts of omega-6 and not enough omega-3, an imbalance that contributes to chronic inflammation throughout the body. A 1:1 omega-6:omega-3 dietary ratio helps keep dangerous inflammation in check. Seeing as how most omega-6 fatty acids can be found in vegetable oils, fake butter products, grain-fed animal fat, and other modern contrivances, it is understood that Grok (our prototype of the primal human) rarely encountered them—especially not in the excessive levels most people see today. Q: What’s the difference between DHA and EPA? A: There are two key omega-3 fatty acids: DHA and EPA. They are both readily found in fish, and they each provide common and unique benefits. They have both been shown effective in reducing triglyceride levels. EPA has been shown to help alleviate cellular inflammation and DHA aids in brain function. For this reason, omega-3 fatty acid supplements typically contain both DHA and EPA. Q: Why do Primal Omegas contain more DHA than EPA? A: The fish oil in its natural form contains higher DHA than EPA. As long as you’re getting a reasonable amount of DHA and EPA, the exact ratio doesn’t matter too much.